Yep, I thought about having Nanakusa-gayu today. Having so much osechi and sake yesterday, warm and comforting rice porridge with healthy herbs seemed like a very good idea. But when I picked up one of the packages of fresh "Nanakusa (seven-herbs)" at a supermarket, my inner voice said, “Hey, with Nanakusa-gayu, you can’t use up the leftovers from yesterday.” That’s right. 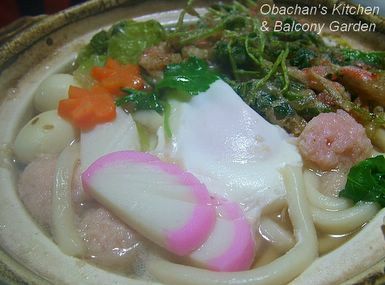 So this is what I had today instead: Nabeyaki udon with lots of toppings. Most of the toppings look familiar, right? What’s on top right is a soggy kakiage made with mitsuba, burdock and dried shrimp. And under the udon noodles, plenty of carrot and daikon strips are hiding. Hope everyone on the face of the earth is happy and contented like me on a cold winter night like this. Obachan you really do have a way with words. Your description of your evening sounds so cozy and heavenly. I’m glad that my udon made someone happy. Hi! Thanks for your comment. Happy new year to you, too. Hope you keep coming back and enjoy my food photos and stories.